Unless you are an SEO expert you probably haven’t heard of LSI (Latent Semantic Indexing) keywords. This isn’t really surprising given that this concept barely gets any attention. But, it definitely should. LSI keywords are the fabric which is used to weave your articles. In fact, most of us use them naturally without even realizing. Nevertheless, they are something that should be polished in order to maximize your rankings. Proper use of LSI keyword can mean the difference between the first and the second page of Google. Still not convinced? Let me persuade you. LSI is a linguistic concept. It’s short for Latent Semantic Indexing. With it, Google determine relevancy of different words and phrases within the text. That being said, LSI keywords represent all the words and phrases that are semantically related to your main keyword. The list includes both synonyms and relates keywords. For example, if you write an article about pizza, you will most likely mention Italy, Margarita, tomato, baking etc. For article to be relevant, it needs to have all these words within it. Always remember; by changing some of the words you are also changing the way Google perceives your article. Let’s say your main keyword is car. If the author frequently uses movie and box office within an article, it is safe to presume that the content is about cartoon “Cars”. On the other hand, if you use LSI keywords such as carburetor or motor, Google will see it as an article about cars, the vehicle. As you can see, LSI keywords can have both positive and negative effect on your content. This is why you need to learn more about them so keep on reading! Google uses vectors in order to “see” words. It puts words in vectors and then, places all these vectors within a virtual space. Within that virtual space, there lies your main keyword. It is surrounded by various other LSI keywords. If some of the LSI keywords are close to it, then the correlation is higher. If a word is distant, then there is little to no correlation. In other words, by frequently using some of the LSIs you are helping Google determine what’s your article all about. On the other hand, some phrases will have absolutely no impact on the search engine as he will see no connection between the two. Lastly, it is not enough for a word to appear within an article. Sometimes, it will have to appear more frequently so that the Google can easily establish connection. If there are numerous LSI keywords within an article, the number of repetition will tell Google in which direction the content is going. For example, if a car blog posted a repair article that frequently uses word carburetor and seldom motor, it is likely they are talking about carburetor repair. On the other hand, if motor is the most frequently used LSI keyword, Google can make different presumption. With the introduction of LSI concept, Google has shown us that the company wishes to focus on a general theme and not over spaming one phrase. This has led to improvement of content through natural use of language. Best way to convey your ideas to Google is to write naturally. If your content is well-written, informative, perfectly describing the topic, it will be easy for Google to pick up these signs and categorize (rank) your article accordingly. 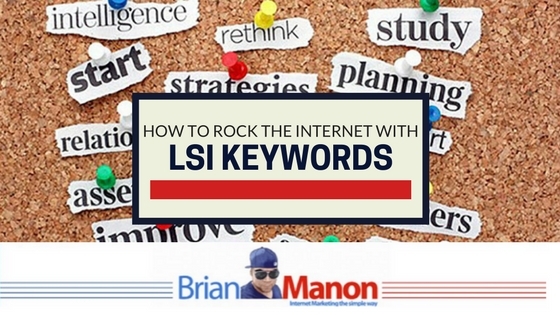 The same way you research the main keyword, you should also research the LSIs. Before you start writing, you need to think about all the phrases that can suitably complement your main phrase. In a way, it is necessary to guide Google to your content. But, you need to be very careful as improper use of LSI keywords can lead him in a completely different direction. Websites that are ranking on the first page of Google are using LSIs properly. Check them out, read their content and make sure to “borrow” some of the phrases they are using. Authors should always read their articles after completing them. This can also help you shape the content and add some of the phrases which you might’ve missed during the writing process. Now you know what’s necessary to reach the first page of Google! There is nothing artificial about LSI keywords. In fact, if you are creating nice, informative articles, you should be able to reach first page of Google no matter what. However, just to be sure, it is necessary to add some of the phrases which you might’ve missed and which may play a role in your article ranking. Do you use LSI keywords? What is your experience with them? Share it in the comment section below! Nikolay Stoyanov is the CEO of NikSto.com – an SEO company that offers SEO outsourcing, consulting and white hat link building services to clients all over the world. Nikolay is a huge Brian Dean fan and a proud graduate of his SEO That Works course. He’s a contributor to many of the most reputable websites about SEO. I couldn’t agree more, definitely something that has helped me see and increase in traffic when I started using it correctly. I didn’t know about LSIs- this is very helpful. Thanks! My background is writing rather than online marketing, so this is fantastic, easy to understand, but very applicable advice. I’ll be sharing this too! Great article, learned a lot! Thank you for sharing your knowledge with me! Wow. I think you actually helped me understand SEO after years of not understanding!! Thanks very much.